It’s difficult on your system to fly overnight two nights in a row, so NASA gave us the day off from flying. Since we’d already been through safety training, there wasn’t a lot we needed to do. After being allowed to sleep in and rest, we were taken to the SOFIA hangar at the Armstrong Flight Research Facility for a tour of some of the “behind the scenes” operations. First, we met with Kevin and he explained to us about the ER-2 High-Altitude Airborne Science Aircraft. He is the project leader on this aircraft and told us a lot about the plane. 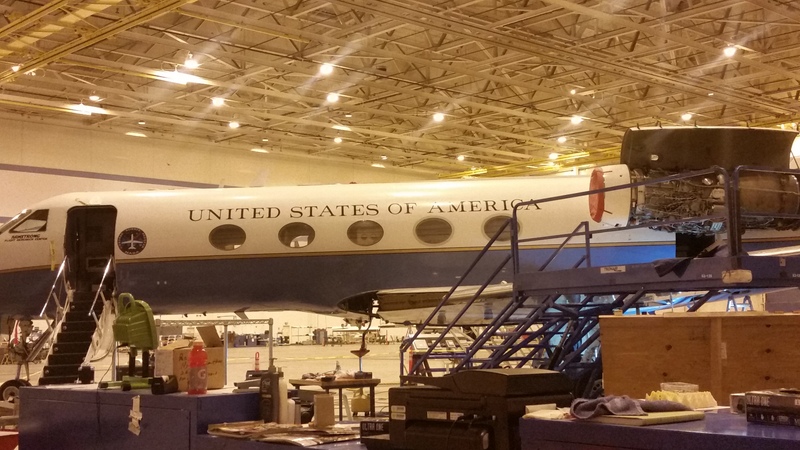 It is a two seat plane that flies up to 70,000 ft and does Earth Science research for NASA’s Airborne Science Program, also housed at the facility. The ER-2 is different from SOFIA because it points the instruments toward Earth collecting information on Earth resources, atmospheric chemistry and dynamics, and oceanic processes. Because of the heavy tail and the wide wings, Kevin said this plane is one of the most difficult to land. Therefore, the pilots must regularly take test flights to maintain their skills. Fortunately for us, today was one of those days and we got to see the plane take off. This plane thrusts one of the sharpest takeoffs of any aircraft and had the quickest takeoff I’ve ever seen. After learning about the ER-2, we met Matt and learned about the DC-8, also part of NASA’s Airborne Science Program. This plane was much larger than the ER-2, but not nearly as large as SOFIA. I would compare it in size to your average commercial plane. This does similar research to the ER-2. 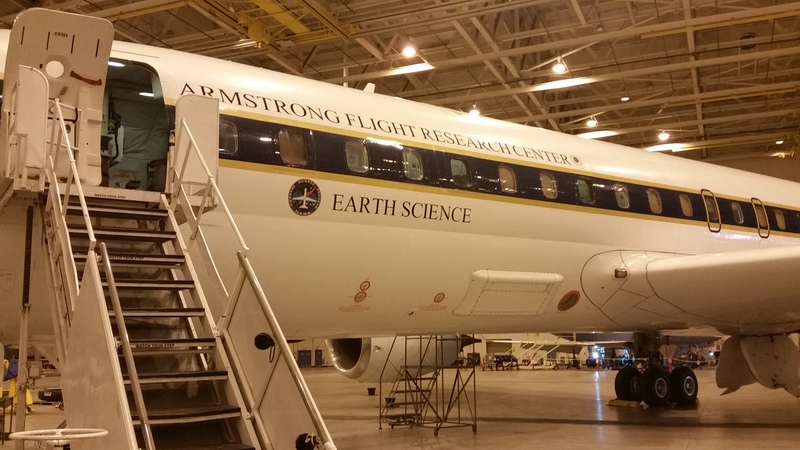 The difference is that on the DC-8, the scientists ride on board during data collection and can adjust the instruments in flight. Whereas in the ER-2 the instruments are all autonomous and can’t be adjusted in flight. The DC-8 has a maximum altitude of 41,000 ft. Matt explained some missions the DC-8 performed in Antartica, Greenland, Hawaii, and other places around the globe. Both the DC-8 and ER-2 were being prepped for an upcoming campaign in Washington state. Next, we met with Zaheer, an Instrument Scientist that performs a lot of the pre and post use maintenance and improvements to the 6 (soon to be 7) instruments used on SOFIA. First, he showed us the Preflight Integration Facility. This is where an instrument is tested and prepared to be fitted to the SOFIA telescope for a campaign. This is the tool NASA uses to simulate SOFIA’s telescope to test and prepare the instruments. 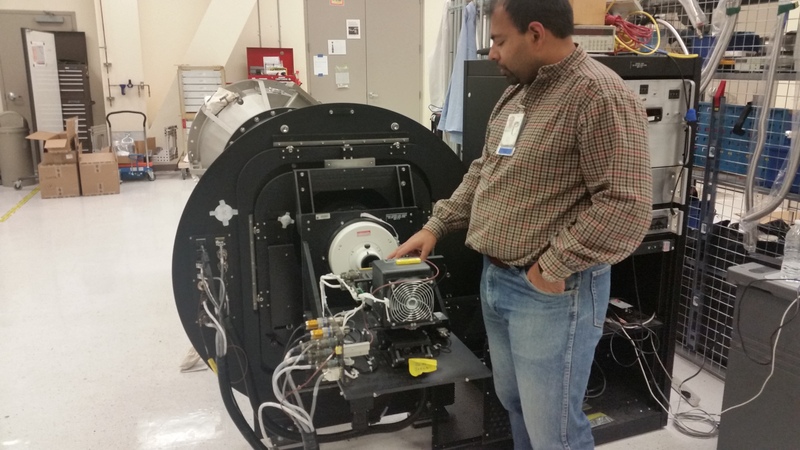 Zaheer then showed us the GREAT Spectrometer, which is another SOFIA instrument that gets spectra readings on molecules in space. He showed us this instrument and explained how modular it was in order to maximize it’s effectiveness as well as make it easily upgradable. He then walked us across the hangar and showed up the Mirror Coating Facility. This is where they would take the removed mirrors from SOFIA and coat them in a metal to make them reflective. The mirrors are huge, so they use cranes to move them and place them. 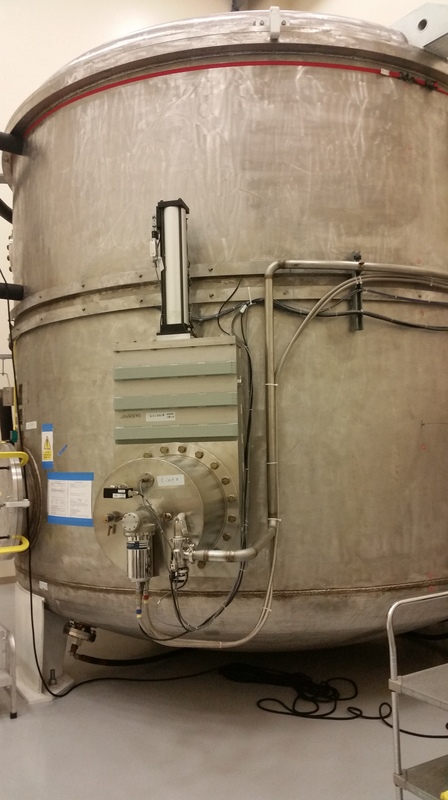 What I found really interesting was that they test their mirror coating vat 3 times a year to ensure it’s readiness. However, they’ve had the SOFIA mirrors since 2009 and haven’t needed to coat them once. It’s great to be prepared. As we ended our tour of the facility, we saw another plane being services and prepared for use. However, the painting on the plane resembled Air Force 1. What we learned was that it was actually a Congressional plane and was being repurposed for NASA use. We then left the hangar and went to an area near the end of the runway to view the takeoff of the ER-2 mentioned above and also SOFIA. It was a nice end to the informational day as we prepared for our final flight on Thursday.